I saw on Peace Love Lacquer‘s facebook page that they, along with a group of bloggers, would be starting ‘Try It On Tuesday’ in order to start using untried polish. Tuesday is one of my unscheduled days, and it seemed like something fun to participate in! I’ve purchased a large amount of colors in a short time, so I definitely have a lot! Today I’ll be showcasing… O.P.I’s Excuse Moi! 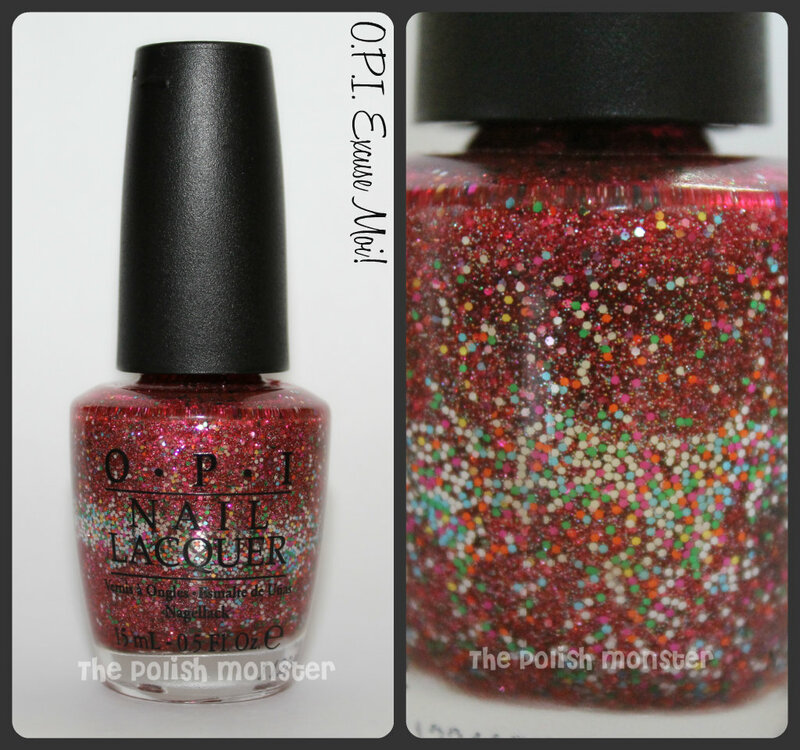 This lovely glitter was a part of O.P.I.’s The Muppets Collection, which was released in conjunction with the movie (of the same name) around November/December 2011. I’m actually very embarrassed this is one of my untried polishes, because it’s also one of my favorites. I didn’t purchase any of these when they came out because I completely forgot! 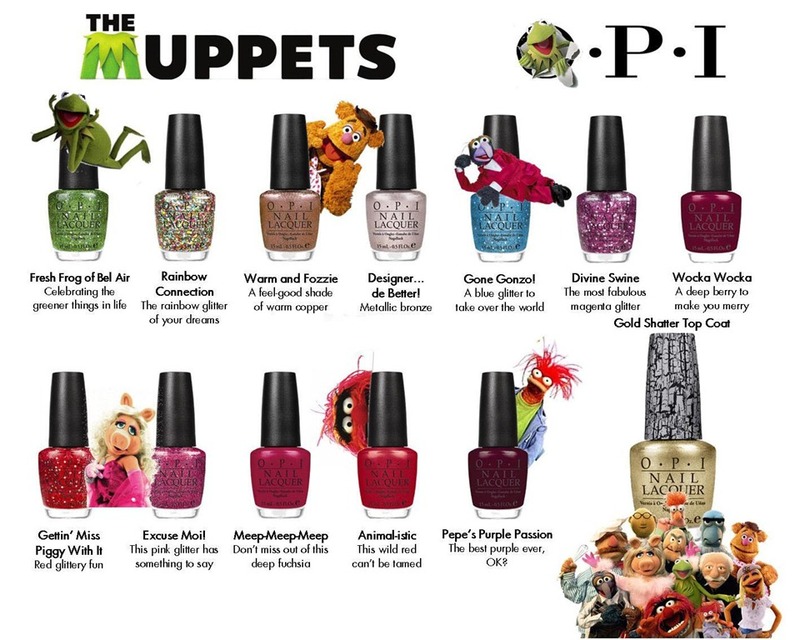 My nail polish obsession didn’t really take off until January, so even though I had heard about these it just didn’t occur to me that they wouldn’t always be around. I have always LOVED The Muppets. I watched The Muppet Show with my parents when I was little, watched The Muppet Movie and The Muppets Take Manhattan until the tapes broke, and watched Muppet Babies every morning in elementary school. My mom has always sung ‘The Rainbow Connection’ to me as our special song. 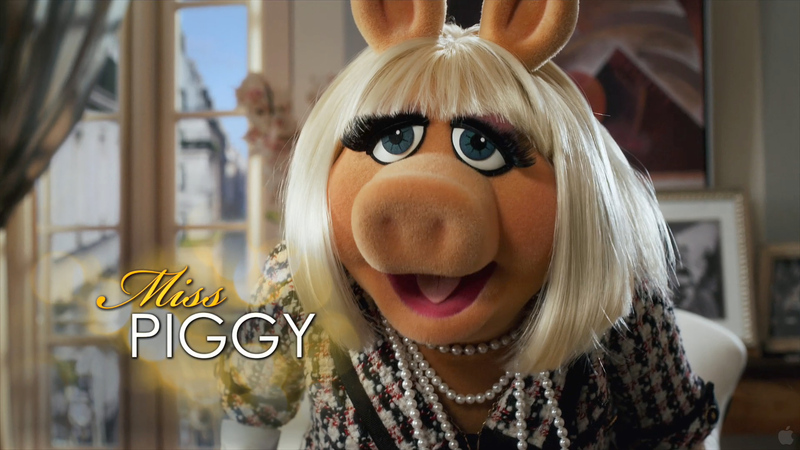 And my very favorite muppet? So aside from it just being gorgeous, I wanted Excuse Moi! because of the character it represented 🙂 I also own Meep-Meep-Meep and Warm & Fozzie from the collection. The second two I was able to find in a salon, but Excuse Moi! eluded me for a long time. I finally found my bottle a few months ago when I stopped into a random nail salon and they let me buy their used bottle for 1/2 price. I was slightly annoyed when I got home and actually examined the bottle (I was too excited in the salon) and realized that it was basically dried up. Luckily for me, I bought some Beauty Secrets Nail Polish Thinner and it worked wonders! I added enough thinner to that polish to make it 3/4 full, and it’s back to normal consistency (that’s how dried it was!). But that explains why my bottle shots have a ring of the larger rainbow glitter around the center. Recently (and as recently as this morning), I’ve seen bottles of Excuse Moi! in Target’s O.P.I. section. This has happened at 2 of the 3 Targets around me. The one closest to me only opened 2 months ago and did NOT have this on the shelves last week. Today there were 3 bottles. I’m not sure if they’re shipping excess stock to various stores, but it can still be found! This polish applied like a dream. O.P.I. does a lot of things well, but when they do glitters you can bet they’ll be amazing. All of the following swatches are only 2 coats, and I had ok coverage at just 1 coat. It is filled with a beautiful small pink glitter, and accented with slightly larger (but still small) rainbow glitters. My nails are SHIMMERING! Did I mention that I had basically no clean up? Even with my small nails, their larger brush glided over nicely and the polish stayed where it was meant to be. The only nail I had trouble with was my pinky, and that’s because it’s slightly smaller than the brush size!